Correlations, which have been retrieved from different samples can be tested against each other. Example: Imagine, you want to test, if men increase their income considerably faster than women. You could f. e. collect the data on age and income from 1 200 men and 980 women. The correlation could amount to r = .38 in the male cohort and r = .31 in women. Is there a significant difference in the correlation of both cohorts? 85 children from grade 3 have been tested with tests on intelligence (1), arithmetic abilities (2) and reading comprehension (3). The correlation between intelligence and arithmetic abilities amounts to r12 = .53, intelligence and reading correlates with r13 = .41 and arithmetic and reading with r23 = .59. Is the correlation between intelligence an arithmetic abilities higher than the correlation between intelligence and reading comprehension? With the following calculator, you can test if correlations are different from zero. The test is based on the Student's t distribution with n - 2 degrees of freedom. An example: The length of the left foot and the nose of 18 men is quantified. The length correlates with r = .69. Is the correlation significantly different from 0? With the following calculator, you can test if correlations are different from a fixed value. The test uses the Fisher-Z-transformation. The confidence interval specifies the range of values that includes a correlation with a given probability (confidence coefficient). The higher the confidence coefficient, the larger the confidence interval. Commonly, values around .9 are used. The Fisher-Z-Transformation converts correlations into an almost normally distributed measure. It is necessary for many operations with correlations, f. e. when averaging a list of correlations. The following converter transforms the correlations and it computes the inverse operations as well. Please note, that the Fisher-Z is typed uppercase. Due to the askew distribution of correlations(see Fisher-Z-Transformation), the mean of a list of correlations cannot simply be calculated by building the arithmetic mean. Usually, correlations are transformed into Fisher-Z-values and weighted by the number of cases before averaging and retransforming with an inverse Fisher-Z. While this is the usual approach, Eid et al. (2011, pp. 544) suggest using the correction of Olkin & Pratt (1958) instead, as simulations showed it to estimate the mean correlation more precisely. The following calculator computes both for you, the "traditional Fisher-Z-approach" and the algorithm of Olkin and Pratt. Please fill in the correlations into column A and the number of cases into column B. You can as well copy the values from tables of your spreadsheet program. Finally click on "OK" to start the calculation. Some values already filled in for demonstration purposes. Correlations are an effect size measure. They quantify the magnitude of an empirical effect. There are a number of other effect size measures as well, with dCohen probably being the most prominent one. The different effect size measures can be converted into another. Please have a look at the online calculators on the page Computation of Effect Sizes. Finally, here you can compute linear correlations. The Online-Calculator computes linear pearson or product moment correlations of two variables. Please fill in the values of variable 1 in column A and the values of variable 2 in column B and press 'OK'. As a demonstration, values for a high positive correlation are already filled in by default. All hypothesis tests on this page are based on Eid et al. (2011). 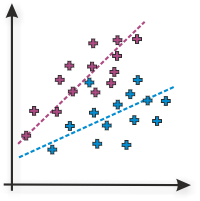 jStat is used to generate the Student's t-distribution for testing correlations against each other. The spreadsheet element is based on Handsontable. Eid, M., Gollwitzer, M., & Schmitt, M. (2011). Statistik und Forschungsmethoden Lehrbuch. Weinheim: Beltz.